At Roof2Room we offer free no obligation roof replacement quick quotes. Fill in this simple quick quote form and we will be in touch within in 24 hours with your estimated conservatory roof replacement price. The Iconic Garden Room is a bespoke, fast and cost effective system. The Iconic Garden Room is a complete conservatory transformation, complete the form and get your quote now. Download our brochure packed with useful information on our products. Click the link below to download our brochure, packed full of useful information about our beautiful conservatory transformations. 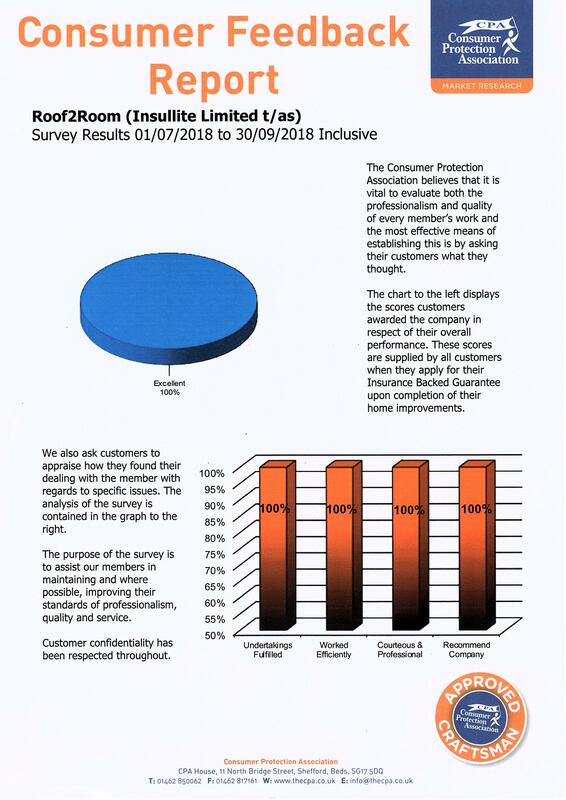 100% positive customer feedback from the Consumer Protection Association. 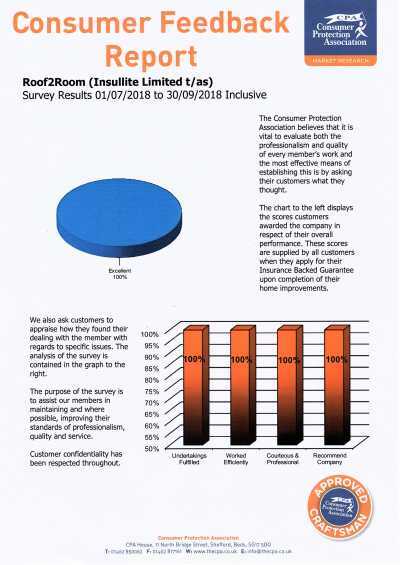 We are proud to boast 100% positive customer feedback, which is given independently through the Consumer Protection Association. We know most conservatories are freezing cold in winter and too hot in summer, that’s why at Roof2Room we are experts in converting conservatories into comfortable rooms that can be used all year round. We specialise in retrofit solutions designed to replace existing conservatory systems. We manufacture and install fully insulated tiled conservatory roof replacements which comes complete with a 10 Year Insurance Backed Guarantee. Our conservatory roof replacement is a strong, lightweight and robust timber system which is a fast and cost effective way of transforming your conservatory into a real room. We also offer the Iconic Garden Room, a pre-fabricated extension solution designed to be installed on your existing conservatory base. When you choose Roof2Room you’re dealing directly with the manufacturer and installer of your new tiled conservatory roof, so we are versatile and can tailor our products to meet your individual needs. We’re always innovating and adding new products to our range, so to complement our range of conservatory upgrades we offer The Canopy Kit, perfect for carports, patio covers and much more. We also install a fabulous range of Iconic Studios, which are perfect for garden offices, studio, home gyms or even a home bar. We are a family manufacturing business based in Greater Manchester and we pride ourselves on providing a friendly and professional service. The conservatory solutions we manufacture are available nationwide through our network of approved installers. If you would like to find out more or get a free no obligation quote then please get in touch. Click the links below to discover more about how our tiled conservatory roofs or Iconic Garden Rooms can add valuable extra space to your home. Is your conservatory freezing cold in winter and boiling hot in summer? If the answer is yes then Roof2Room have the solution with our Tiled Conservatory Roof System, designed to completely replace existing conservatory roofs with a new thermally efficient roof. 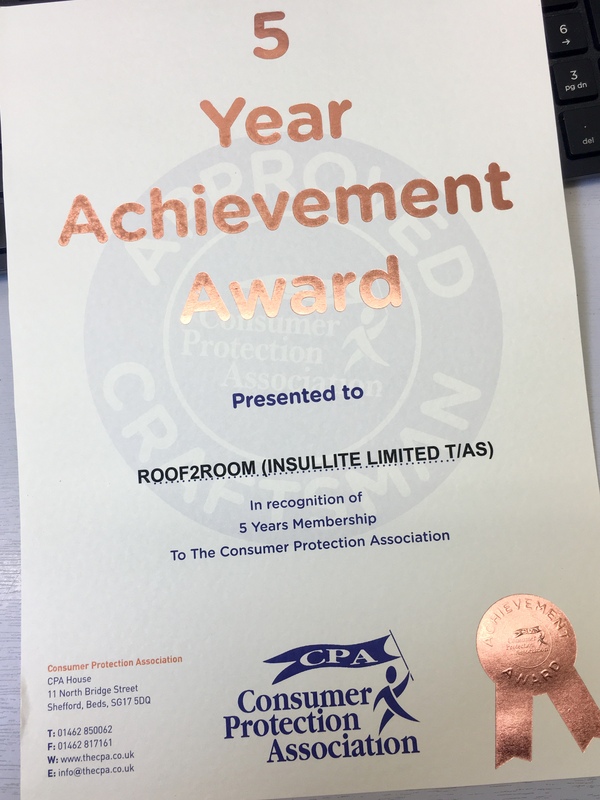 Not only does a new tiled conservatory roof make your conservatory cozy in winter and cool in summer but our roof system uses a multi-layered insulation system which also deadens the sound from rain or hail. A solid conservatory roof installed by Roof2Room comes complete with a 10 Year Insurance Backed Guarantee, giving you the extra peace of mind that you’re in safe hands when you choose us for your new conservatory roof. We have lots of options available with our conservatory roof replacement, including LED lighting, a plastered pelmet and genuine Velux windows. We offer the largest choice of lightweight roofing tiles from the worlds leading manufacturers Tapco Slate, Decra Tiles, Britmet and Metrotile. Every new tiled conservatory roof that we install is specifically tailored to suit our customer’s requirements, contact us today for a Free No Obligation Quote. The Iconic Garden Room is a fast home extension system designed to be installed on your existing conservatory base but also suitable for new build projects. The ultimate conservatory conversion made up of super insulated structural columns, new window frames, A-rated glazing and then it’s all topped off with our thermally efficient Tiled Conservatory Roof. The Iconic Garden Room is a fast and affordable alternative to a traditional brick extension with most installations being completed within 2 weeks. As with our conservatory roof replacement system, the Iconic Garden Room is extremely thermally efficient with its multi-layered insulation system. The engineered timber structural columns are packed full of insulation, creating great heat retention and also eliminating external noise. Combine this with the excellent 0.18 U-Value of the new tiled conservatory roof and new A-rated windows and you’ve got a warm and comfortable room that will lower your energy bills. Add valuable extra space to your home with an Iconic Studio, manufactured and installed by Roof2Room. The Iconic Studio is built by professional tradesmen to your exact specification. This makes it extremely versatile with limitless possibilities, giving you the opportunity to create a comfortable and functional room in your garden. Investing in an Iconic Studio creates an opportunity to add a beautiful space you can use all year round, this is because we use two types of insulation in the construction process, multi-foil insulation and thermal acoustic insulation. Our Iconic Studio doesn’t have the look and feel of a traditional garden building, this is because we utilise modern architectural designs with a plaster skim finish internally as well as A-rated windows and LED lighting options. This gives you a high quality ‘home from home’ which can be used as a garden office, home studio, playroom, home gym or even a man cave. Whilst replacing your polycarbonate or glass conservatory roof with a new tiled conservatory roof, it may also be beneficial to replace your conservatory window frames and glass. At Roof2Room we offer competitive pricing on conservatory frames and glazing, we can either replace like for like or install a more modern window configuration such as attractive grey frames and full height glazing. The frames we install are manufactured to a high standard using the Liniar energy efficient multi-chambered uPVC profile. The Liniar range of casement uPVC windows is available in a range of colours including White, Cream, Chartwell Green, Grey, Black, Irish Oak, Golden Oak, Mahogany and Rosewood so you’re likely to find the ideal match for your home. Liniar casement windows comprise our multi-chambered uPVC profile, which works to trap in pockets of warm air and maintain the warmth in your home. Enjoy A+ rated standards, today. To complement your new conservatory roof, we offer the option to insulate and clad the sides of your conservatory. The insulated privacy wall is a fast and cost effective way of transforming your conservatory into a real room. 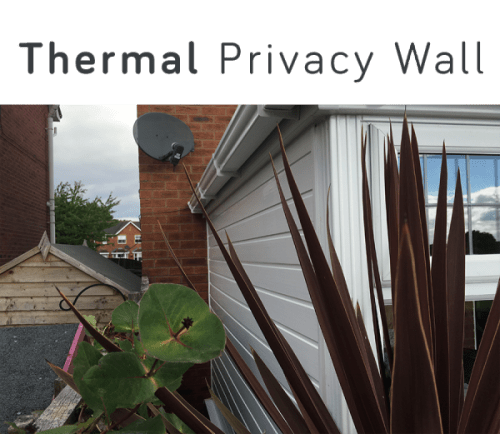 The privacy wall is normally installed on the side of your conservatory which is closest to the fence or boundary. The wall is externally clad with UPVC matched to your existing conservatory frames. We then plaster skim the wall internally giving you the option of a flush finish. The wall is insulated with the latest in lightweight insulation. This ensures the wall has an exceptional thermal performance to match the tiled conservatory roof. We also use external ventilation and a vapor control layer, meaning the new privacy wall will stay condensation free. Call us on 0161 241 8090 to arrange your free quotation. 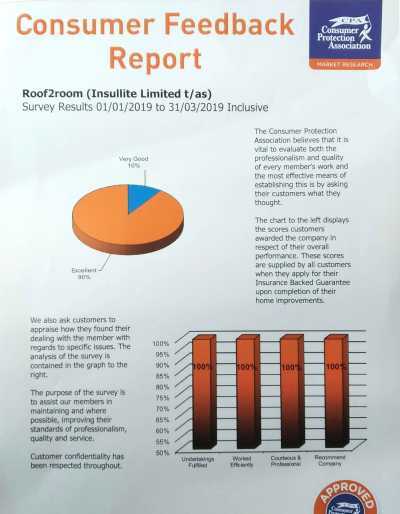 At Roof2Room we work with industry leading brands in the installation of our tiled conservatory roof system including Tapco Slate, Velux Windows, Decra Lightweight Roofing, Metrotile and many more. Fill in the Quick Quote Form and a member of our team will be in touch. Our Tiled Conservatory Roof and Iconic Garden Rooms are also available throughout the UK, through a network of partner installers. If you’re looking for a tiled conservatory roof in Lancashire, Manchester, Cheshire, Yorkshire, London, Birmingham, Wales, Scotland or anywhere else in the United Kingdom then our lightweight roof system is available in your area. 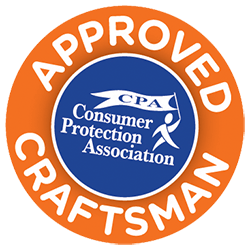 All of our installers are experienced professionals and will work closely with you to help you achieve the perfect space you can enjoy all year round. 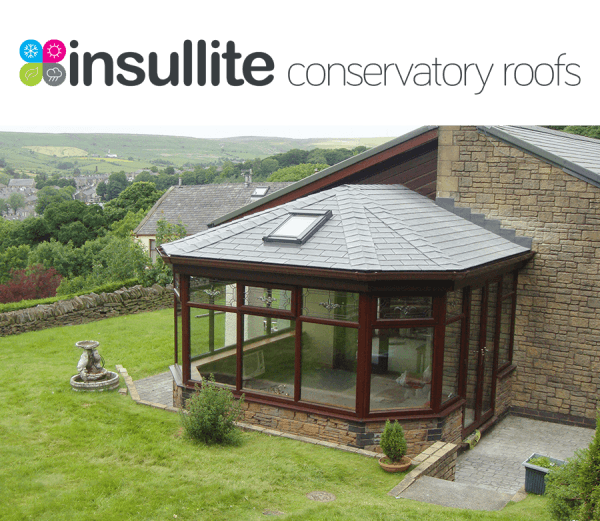 If you would like to know how much it costs for a conservatory roof replacement then please get in touch and one of our friendly Insullite approved installers provide you with a free no obligation price and will guide you through the process. Call 0161 241 8090 and our friendly team will be happy to help. Complete our handy quick quote form and we will be in touch within 24 hours. Roof2Room offer free no obligation quotes, get in touch today to make your conservatory conversion dreams a reality. Call us on 0161 241 8090 and a member of our friendly team will assist you. Alternatively submit a conservatory roof Quick Quote by clicking below.